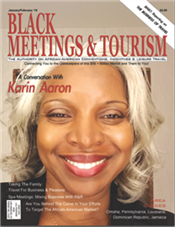 Black Meetings and Tourism collects user information in various ways: personal information (e.g. name, e-mail address, mailing address, industry, occupation) that you supply when registering for, subscribing to, bidding on, or purchasing services or products through our web sites ("personally identifying information"), information that you provide regarding your interests, and activity and preference tracking information from our use of "cookies" and other aggregate activity logging. Black Meetings and Tourism does not collect personally identifying information from our users other than what is supplied to us on a voluntary basis. Black Meetings and Tourism may provide personally identifiable information, voluntarily provided by visitors, to third parties who provide products and services that Black Meetings and Tourism believes our visitors may be interested in purchasing, obtaining, or learning more about. Many visitors and subscribers find this a valuable and time-saving service. Unless you provide an "opt-out" notice, we may (and you authorize us to) provide your personally identifying information as part of our visitor and subscriber lists for each such third party to use, if we believe our subscribers would be interested in receiving an e-mail or other written correspondence from any such third party. Regardless of any opt-out notice, we will provide your personally identifiable information to third parties if we believe in good faith that the law requires us to do so or if it is necessary to protect the rights or property of Black Meetings and Tourism or our users. In the event that you do not wish your personally identifying information to be used by third parties to send you information about products and services, you may opt-out of this service by checking the "opt-out" box wherever provided. In addition to such options made available to you when we collect your personally identifying information, you may opt-out of this service at any time by mailing us a letter or sending us an e-mail at the address below, specifying that you have elected to opt-out of any third party mailings. Include your full name, address, and e-mail address with your notice to: Black Meetings and Tourism, Privacy Manager, 20840 Chase St. Winnetka, CA 91306-1207. We will update your records as promptly as practical; however, you may receive third-party communications while we process your request. Black Meetings and Tourism has implemented a number of security features to prevent the unauthorized release of or access to personally identifying information, such as firewalls and secure servers. The secure server encrypts all information you input before it is sent to us. Please be advised, however, that while we have endeavored to create a secure and reliable site for our users, perfect security is not yet available on the Internet and the confidentiality of any communication or material transmitted to or from us via our sites or e-mail cannot be 100% guaranteed. Accordingly, we are not responsible for the security of information transmitted via the Internet. Once we receive your transmission, we make our best effort to ensure its security on our system. Only authorized personnel have access to any stored personally identifying information which Black Meetings and Tourism may collect from its users.